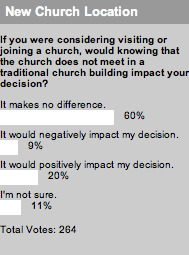 60% of CMS readers say it makes no difference whether you meet in a church building or a non-church building. That number was a bit higher, 73%, in the North American Mission Board’s poll. Only 9% of you thought it would negatively impact your decision of joining a church if they met in a non-traditional church building, while 19% of the previous poll’s respondents answered the same. The largest disparity is that 20% of you would be positively affected by not meeting in a traditional building, while only 6% agreed in the earlier study. Finally, 11% of you are unsure, while only 2% of the previously mentioned poll were unsure. The results? I don’t know about you, but I think they all point to one answer: CMS readers are far superior to the general public. This week, make sure you let us know what you like about us! The new poll is up, so head over and vote. It is so tempting to vote that I’m just here spying. That’s a great one.